Van Morrison – Doris Dawn – Mature Model. “Stand for Khrist” sent “Bring it on Home to Me” in with Van, Jeff Beck, and Tom Jones jamming the Blues. What a treasure! Enjoy! Thanks Stand! Van’s and TJ’s favorite music? The Blues. Both should have sung more Blues. But as was the case with Elvis, the Blues was not selling in their day, and so it was difficult for them to get blues work done and published. Sad! But we can be grateful for the few songs we do have from them of the Blues. Sam Cooke wrote this one. For new folks and those who may have missed it, our group voted Van Morrison the greatest male singer/songwriter/composer/musician ever, in part because of his vast diversity, and because he can play almost every instrument (and well), and also because of his wonderful writing and masterful composing. Van has written the lyrics for and musically composed 496 songs with hundreds of topics, all of which have been published. E. nominated him for the voting. In our view, only Tori Amos among those with the ability to write and compose their own pieces, then sing and play them, can compare to Van. Sorry we couldn’t find this song live, but we can still hear Van’s voice and, of course, everyone has to recognize B’s guitar, because there’s only one guitar sound like this one. Great video too. BB’s guitar is like Chris Botti’s trumpet. Nobody makes one, single sound the same as they do. Van’s first album “Blowin’ Your Mind” in 1967 went fairly well containing songs like “Brown Eyed Girl,” and we all thought something like, “just another Rock & Roller.” Wrong! My thoughts, as were those of others, something on the order of, “Besides being innovative beyond imagination, it was other-worldly.” We figured this was the direction Van was going, but no! Next came his third, “Moondance” in 1970, which again was totally different. After hearing and studying “Astral Weeks,” however, we knew we had a genius amid us. Or, at least someone capable of thinking for himself and with nerve enough to change his music drastically from the norm of the day. That alone is rare! 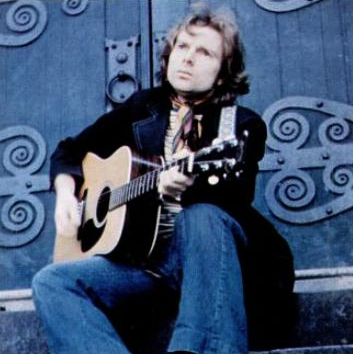 Most people have not heard “Astral Weeks,” but as an example of Van’s lyrical powers, here’s the first verse and the finish of that piece. Dear Lord, thank you for giving us such genius to enjoy! Posted in Celebrities, ReflectionsTagged folk music, musicBookmark the permalink.